When the Women's March on Washington event first posted the day after the election of Donald Trump, I immediately marked myself as interested. Like may secular, liberal, millennial women, I was devastated and taken completely off guard with the outcome of the election. I kept thinking about the way Megyn Kelly had been treated, about my undocumented friends and family, my LGBT friends and family, and all the people of color in my life. But the Women's March on Washington was scheduled to be the same day as the West Coast Walk for Life, an event that my group Pro-Life Future San Francisco had already promised to be a part of. But then it was announced that there would be a sister march in SF later in the day, and I knew we would need to be there. The controversy that followed only solidified this. 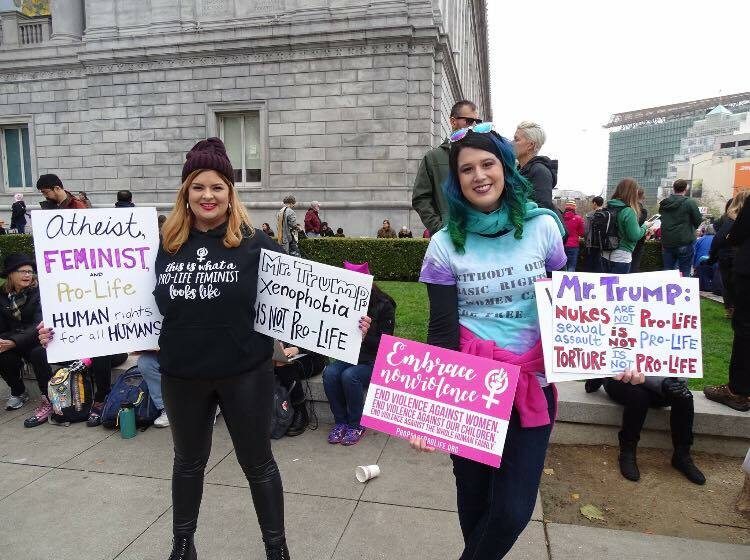 As New Wave Feminists were accepted as a partner in the DC March, only to be abruptly dismissed, a national spotlight shone on the question: Can you be pro-life and be a feminist? And of course my heart and the hearts of many other pro-life feminists across the country, screamed YAS. So we decided to join. And organizers of the San Francisco Women's March released official statements welcoming pro-lifers to participate. I beamed with pride for my city. 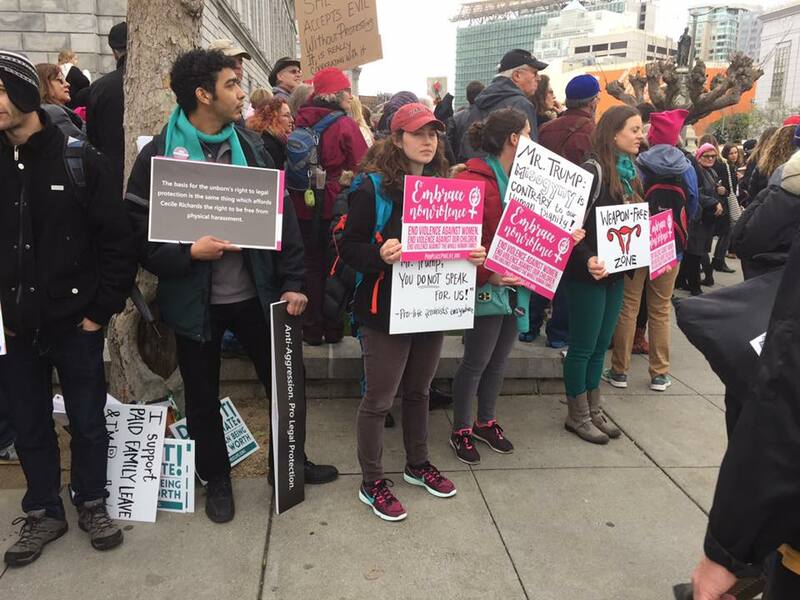 The West Coast Walk for Life drew 50,000 attendees to Civic Center and down Market Street for the annual event. As the crowd moved from the plaza to Market Street, attendees of the Women's March began to fill the plaza. I was joined by pro-life friend and ally Aimee Murphy of Life Matters Journal as well as about 10-15 (give or take depending on the time) members of our respective groups. I held signs that said "Atheist, Feminist, and Pro-Life - Human Rights for All Humans" and "Mr. Trump, xenophobia is not pro-life." Several of us wore shirts that read "This is what a pro-life feminist looks like." The crowd was absolutely fascinated with us. We posed for pictures, received head nods of approval and high fives. Several people told us they were glad to see us there. 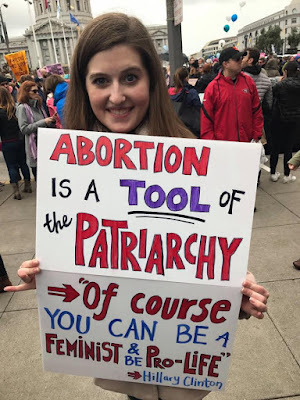 One woman carried a sign with an image of a hanger with an x through it. She said to us "I heard on the radio that some pro-lifers felt that they weren't welcome here and I wanted to let you know that you are." She spent some time asking us about our pro-life position and agreed that the non-violent premise was compelling. 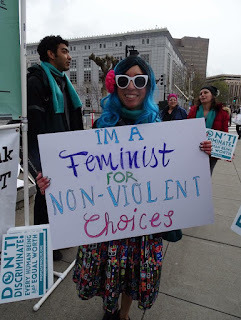 She shared her concern that women would die from illegal abortion procedures, and we assured her that is a concern of ours as well being that we're feminists. She truly treated us with respect and kindness. It was a wonderful interaction that upheld the dignity of everyone involved. Another woman came up to me and said "I respect your opinion, but you should respect my choice." She then proceed to chant "pro-choice, pro-choice." But none of the crowd was interested in joining in so she stopped. That was literally the only opposition that we encountered, and even in that interaction she opened with expressing respect for my opinion. You can imagine that by this time my pride for my city swelled even further. I left the rally with optimism and real hope for the pro-life cause. Pro-life feminists are out there, and we are in every city in America. We must amplify these voices and do all we can to reach every human being with love, kindness, and understanding. Together, we can work to abolish the barbaric, antiquated, and horrific practice of abortion in America.